The community center in buckwheat producing district. Kanasago-cho is the hidden specialty ground of buckwheat noodles. There is little flat ground and it is the area where a low mountain continues. In the middle of the travel for eating the buckwheat noodles of Ibaragi, we came to the hot spring of Kanasago. 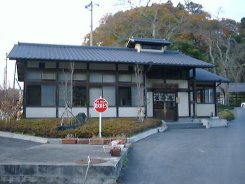 Sato-no-yu are the community center of Kanasago-cho. 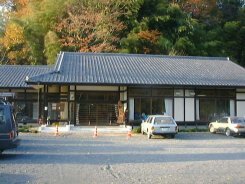 It is the building with a tiled roof which matched scenery. The mineral spring is used there. Although it is the simple bathroom of only a main bath, the green of mountains is visible from a big window. It is a pleasant temperature although the water is somewhat hot. My skin became smooth when I was taking a bath. Even if it asked the people of a reception desk, the nature of the water of a hot spring was not found. The water may be strong alkalinity. There are two rest rooms. One is a room with the karaoke in which a local old person gathers. Another is the quiet room which is next door to an entrance. I looked at outside, sleeping on a tatami after bathing. I felt like being in the nostalgic country. It is the place which can settle down. The Yamagata-cho course is a shortcut. But, when we visited, the course had closed. or the next day at a public holiday.